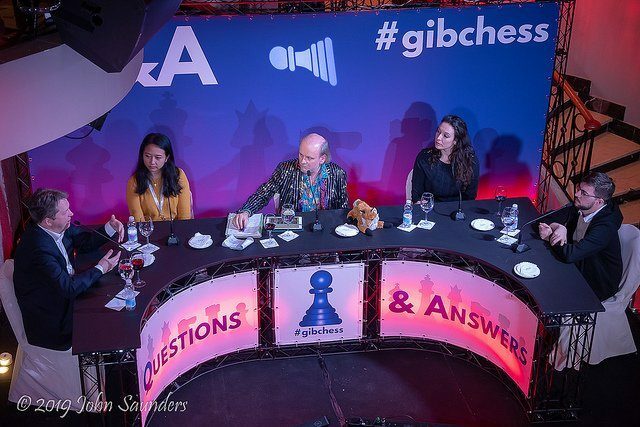 First tournament of the year, Gibraltar is now the routine destination for me. I love the atmosphere there, with all the other french players, more than 10 of them this year. The numerous friendly evenings are also part of the fun: team blitz, tarot, mini table tennis, « Battle of the sexes » on a giant board, etc. Despite the loss of my passport, I arrived on the Rock 48 hours before the beginning of the tournament, determined to enjoy my stay, but also to begin the sporting year on a positive note, in the always difficult context of a strong Open. Kiik-Mvl, round 1; very hard to convert for black. Had Kiik just done nothing, I would probably have had to go through the …g5-g4 break, which would inevitably generate counterplay for white. But he opted for the very bad 58.g3?, which fatally weakens the position; 58…Qc5 59.Kg2 Qc1, and I put him out of his misery after 60.Qb4? De3! 0-1. All smiles with the chief organizer, Brian Callaghan (Photo John Saunders). Mvl-Puranik, round 2; a nice resource ahead for black. 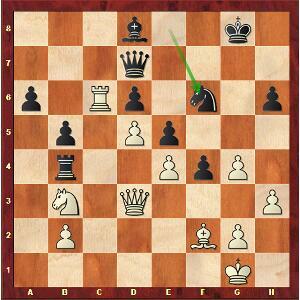 Here, I intended to play the natural 19.Be3 Qd3 20.Qa2! (but not 20.Qe1? Nxb3! 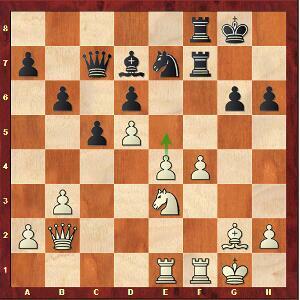 21.Rxb3 Qxc4), and the threat 21.Bf1 seems to be giving the advantage, as Black’s Queen is trapped. But I realized that black could then sacrifice the Queen with 20…Fxc3 21.Rd1 Qxe3!, and although he has merely Bishop and Knight to compensate it, the lack of access to black’s position would have prevented me to progress in any way. Therefore, I chose the slightly superior endgame after 19.Nd5 Bxd5 20.exd5 Qd3 21.Bf1 Qxe2 22.Bxe2. Then I won a pawn, but at the cost of a transposition into a Rook + opposite-coloured Bishops ending almost impossible to win. Here, in spite of a 15-minute think, I really went crazy with 42.Rf1?. I simply overlooked that after 42…Rxb3, if 43.Be6, black has the winning 43…Rc3! (but not 43…Bd4? 44.Rf7+ Kg6 45.Rxe7 Re3+ 46.Kf4). So I quickly wrote off 42…Rxb3, and focused on the other possibilities 42…Rf8 44.Bh3 or 42…Bg3. So once the move 42…Rxb3 was on the board, I had to move backwards and start defending the pawn-down ending by 43.Bd7 Bc3 44.Bb5 Rh3 45.Kf5 Rxh4 46.Ke6!. After grabbing e7 and the transfer of the King all the way to b6, I succeeded in salvaging the half-point, at the end of a not too reassuring game. A not so simple game – far from it ! 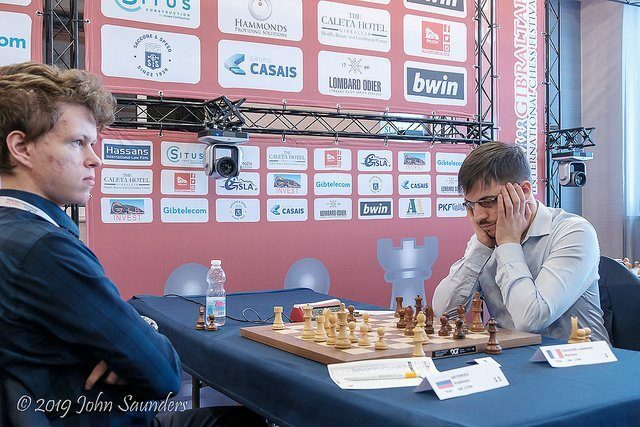 – against an unknown Nigerian player who, all the same, had beaten two GMs in the first two rounds ! Moreover, he played very correctly in the opening, and I was literally stunned when I saw him unleash 16…Nc2 a tempo in the following position!jouant 16…Cc2 a tempo ! Mvl-Onabogun, round 3; 16…Cc2, what a hell of a nerve! I had so many tactical shots at my disposal that I was pretty sure I would find a win when I started calculating. Admittedly, 17.Bh6? gxh6 18.Nxe7+ Rxe7 19.Qxf6 Re6 doesn’t work. 17.Be3 Qxb2 doesn’t seem sufficient either. 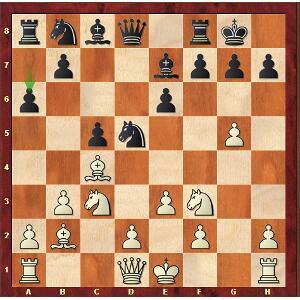 17.Bg5 was also interesting, but I focused on 17.e5, which looked so tempting ! After 17…Nxa1 18.Nxe7+ (but not 18.Nxg7? Kxg7 19.exf6+ Bxf6 20.Bh6+ Kg6!, nor 18.Bg5 because of the pretty 18…Nd7! defense) 18…Rxe7 19.exf6 Re6!, black seems to hold. I don’t know if my opponent was aware I had bunches of tactical shots available after his 16…Nc2, but the fact is that I resolved myself to play the trivial 17.Rb1, and after 17…Nd4, black has equalized! The art of walking through a minefield while whistling! You can eat and follow Maxime’s game after the equalizer 17…Nd4 at the same time! (Photo David Llada). Luckily for me, after 18.Nxd4 Qxd4 19.Rd1 Qe5 (19…Rad8 was possible) 20.Bf4, he didn’t throw 20…dxe4 in, and I took advantage of it after 20…Qe6?! 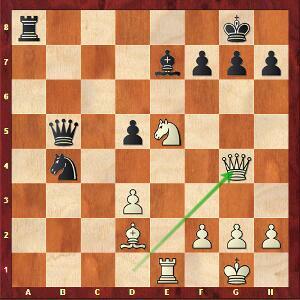 21.exd5!, leading to a favorable ending, down to a pure Bishop ending after move 40. 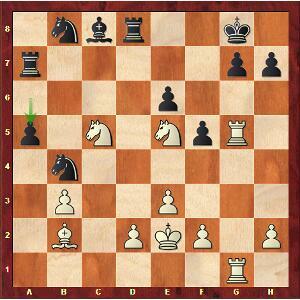 Here, white could get an easy win with 41.Ke2! g4 42.hxg4 hxg4 43.Kd2 followed by 44.Kc2, then b3 and taking back on b3 with the King, to keep the furthest pawn on the a file. Instead, I played 41.b3? axb3 42.axb3 g4+ 43.hxg4 hxg4+ 44.Ke2. You can see that a pawn on the a file would be unstoppable in this position, while this is far from being the case with a b pawn. 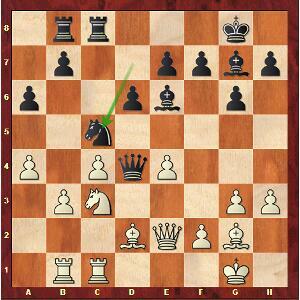 Had he been watchful and played 44…Kf7! 45.b4 (45.f4 Bf6!) 45…Ke6, my opponent would have been a heavy favourite for the draw! 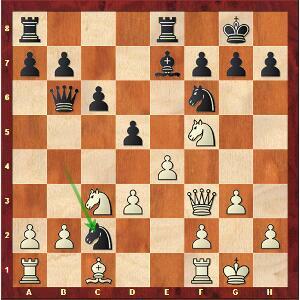 But he forgot that after the natural 44…Kf6?, white has 45.f4!, and the prise en passant is forced not to lose d4. And after 45…gxf3+ 46.Kxf3 Ke6 47.b4 Kd5 48.b5, it is not the same story at all, as white’s King will reach f4 thanks to the threat of exchanging Bishops! That’s just the way the game ended: 48…Bb8 49.Bd8 Bd6 50.b6 Kc6 51.Bc7! 1-0. Whew! 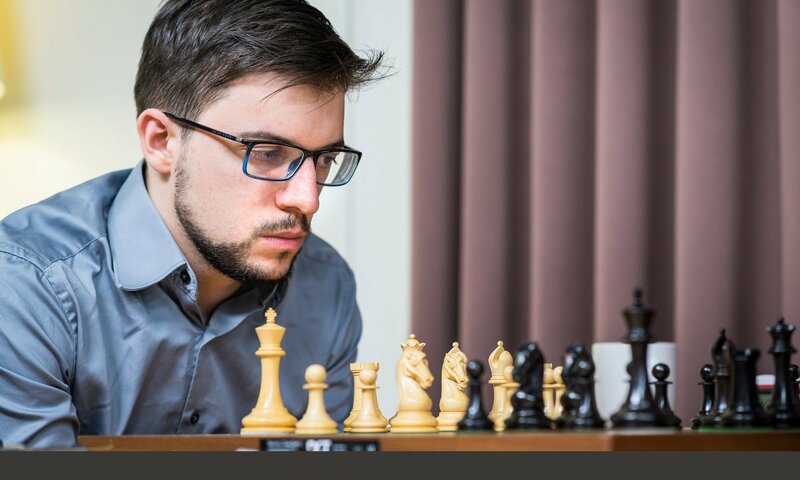 Team blitz tournament (Photo Niki Riga). Here, I castled a bit too mechanically, allowing the manoeuver Nd1-e3. 16…Qc7! first was more precise. After 16…0-0?! 17.Nd1! 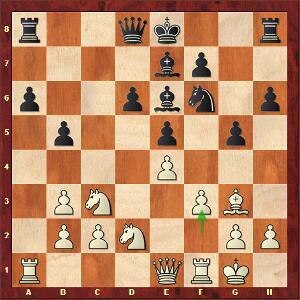 Nh5 18.Ne3 Ng7 19.Bf2 f5 20.c4, the position became sharper. The computer prefers white, but I didn’t feel worse during the game! After another inaccuracy on my part (31…Qd7?! instead of 31…Rc4! =), the machine shows that white could take a large edge by surrendering e4 in the following position, a concept far from obvious when seated in front of the board! 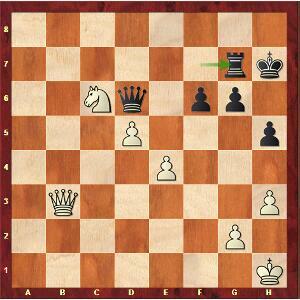 Vocaturo-Mvl, round 4; what a complicated position! 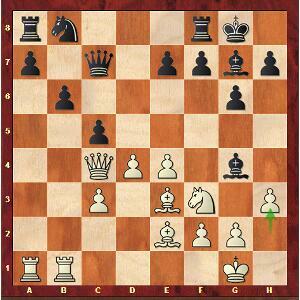 White missed 33.Rxa6!, when e4 is immune, due to 33…Nxe4 34.Nd4! with the idea 34…Nxf2? 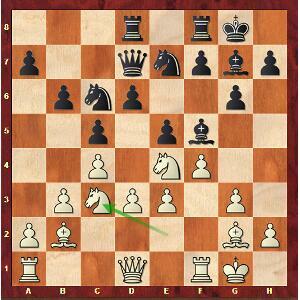 35.Qg6+ which is a killer. And if 33…Rxe4, it’s 34.Nc5! dxc5 35.Rxf6 Bxf6 36.Qxe4 which looks decisive. We both missed the theme, and after 33.Nd2? Rxb2 34.Rxa6 Qc7, Vocaturo should have played 35.Ra8, with a dynamic balance. But he preferred 35.Rc6? Qa5 36.Rc2, and I was the one to miss a chance with the simple 36…Qa1+ (instead of 36…Rxc2?) 37.Kh2 Qa2! 38.Rxb2 Qxb2 and white is in danger. Undoubtedly, I felt off balance at the beginning of the tournament, my brain just wasn’t working efficiently. 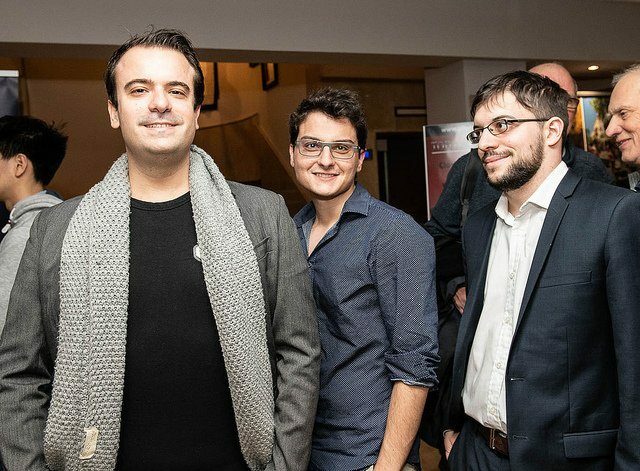 Part of the « French Connection », with Romain Edouard and Maxime Lagarde (Photo David Llada). … I didn’t know this sub-variation 5…dxc4. 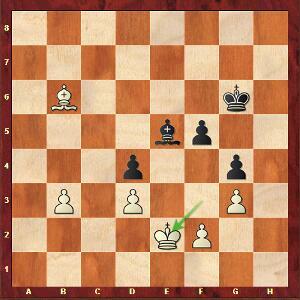 Therefore, after 6.Bxc4 c5, I took the decision to be upfront and straightforward with 7.g4! ?, after a rather rare – by my standards – 23-minute think. I also took into consideration the fact that a normal plan with d4, or even a d3/Cbd2, would leave her in her comfort zone. So I was going to take her out of it by force! Both of us got a bit lost in the complicated tactical lines arising after 7…0-0 8.g5 Nd5 9.Nc3 a6. I felt 22.Ncd7 could win on the spot, but 22.Rxg7+ was too tempting! After 22…Rxg7 23.Rxg7+ Kxg7 24.Nc6+ Kf8 25.Nxd8 Ke7 26.Ndb7, being a pawn up with black’s weakness on a5, I had no doubt about the game’s outcome. A relatively quiet draw against the eventual tournament’s winner. The funny thing is that Artemiev was shocked to see me across the board. Leading the field with Navara, he assumed the pairing was obvious and didn’t check it. He just forgot that in Gibraltar, you are offered the option of taking byes, which Navara did for this round! Against the Russian Artemiev, eventual winner (Photo John Saunders). Mvl-Tari, round 7; not such an innocuous position. 25.e5! Rxf4 26.Rxf4 Rxf4 27.exd6 Qxd6 28.Nc4 Rxc4 29.bxc4 Nf5 30.Bh3! gave a technically winning endgame. The Vietnamese chose an old line against the Grünfeld, which I often played with both colours. Le Quang-Mvl, round 8; a lot of memory required. 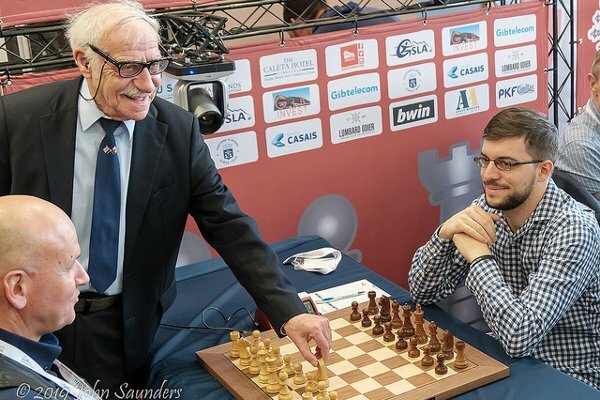 Here, I almost played a quick 16…Bc8, as Caruana did against me in 2013, during our World Cup ¼ final, when he took 50 minutes for the move! I still remembered in time that 16…Bd7 is better, and after 17.dxc5 bxc5 18.Qxc5 Qxc5 19.Bxc5, I could draw by force with 19…Bxc3! 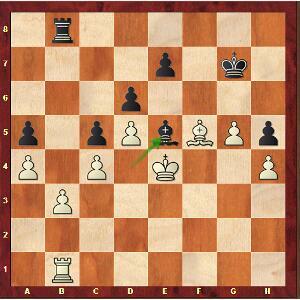 20.Ra3 (20.Rxa7 Rxa7 21.Bxa7 Nc6 =) 20…Bg7 (20…Bf6? 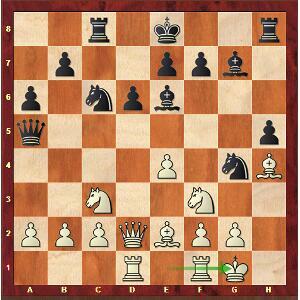 21.e5) 21.Bxe7 Re8 22.Bd6 Rxe4! (the move I missed). I chose 19…Bc6 instead, and I was slightly worse after 20.Rxa7 Rxa7 21.Bxa7 Nd7 22.Bd3!. Fortunately, the activity of my pieces happened to give enough compensation for the missing pawn. 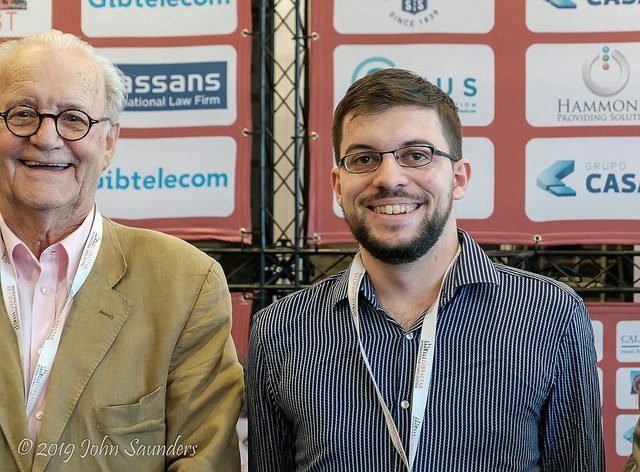 Over the grill of a Questions & Answers session, along with Nigel Short (Photo John Saunders). A typical game where the opening prep works perfectly! 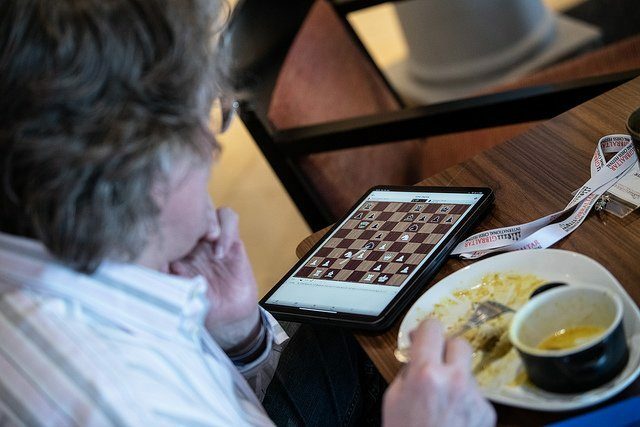 My trainer Etienne Bacrot had discovered the new idea 19.dxc6 Nxc6 20.c4 during the prep of a game against Aronian. 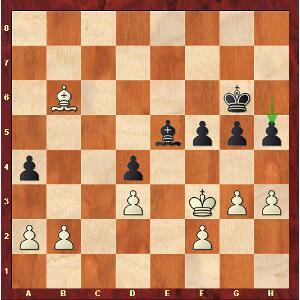 Our analyses were covering the line chosen by Alekseenko up to 25.Qg4. Mvl-Alekseenko, round 9; still in the prep! Here, my opponent, who had already spent almost 1 hour just to counter my novelty, didn’t find the critical 25…Nc2!. I knew that 25.Nxf7 Nxe1 (25…Kxf7? 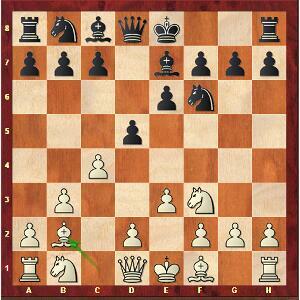 26.Qe6+) 26.Qe6 was leading to a draw if black could find the only move 26…Qb8!, and white has nothing better than the perpetual. In this case, I would have chosen 25.Rc1! ?, and even if there’s no objective advantage for white after 25…Qb2, I would still have had good reasons to keep the game going with 26.Qf5, or even 26.Nxf7, especially against an opponent whose ticking clock showed only 15 minutes remaining! In the game, Alekseenko sinked after 25…Ra7?! 26.h4 Nc6? 27.Bh6 Bf8 28.Nd7! and white is winning. Having countered the 6.Be3 variation against the Najdorf with 6…Ng4 and not 6…e5, I was surprised to see the young Indian taking a lot of time for the following moves, although I already played numerous games with both of those replies! After the game, he made it clear that he had only prepared 6…e5. So, he was clearly struggling in the opening, went into a rare and objectively doubtful line (12.Nf3?! ), and I quickly got an edge with black, after a series of normal developing moves. Karthikeyan-Mvl, round 10 ; hastiness! The simple 16…Bxc3 would have kept a clear edge. But I had already planned to play 16…Rg8?, which I did very quickly, before realizing that I was just allowing white to solve all his problems with 17.Nd5! Qxd2 18.Rxd2. 18…Bxd5 19.exd5, and decided to complicate matters with 18…Bh6 19.Rdd1 f6, but it turned against me. And when you take such a bad decision as 16…Tg8?, you enter a downward spiral, a mistake usually calling for other mistakes to be made. Afterwards, I tried hard to set up nice tactical traps, but my opponent very cleverly navigated through them, and didn’t let me any realistic chance of salvation whatsoever. Talking about the future, I now know that I won’t play any official tournament before late April or early May, after which the schedule will be fully packed throughout the remaining months of 2019. So I have three months ahead of me to work on the adjustment of all the settings! 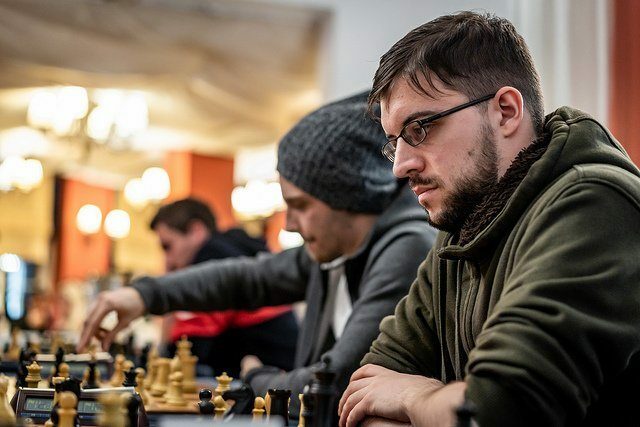 A few days after Gibraltar, Maxime played in the monthly blitz tournament on www.chess.com, the « Titled Tuesday », which always gathers an impressive number of strong GMs. While streaming his games live on the channel www.twitch.tv/mvlchess, he finished at a reasonable 8/10. Not enough though to challenge Grischuk, who was on fire; the Russian won 9 straight games, before to settle for a quick last-round draw!